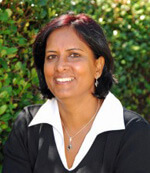 As Strategic Advisor for OmniVue, Dipti Steele provides guidance on strategic projects. She possesses the unique ability to help organizations align their technology investments with business goals and strategies. Her experience at large public companies, including Nike, Home Depot Supply and Ernst and Young enables Dipti to provide OmniVue clients with the highest level of professional services and support. She excels at managing to business objectives, while forging strong relationships at all levels within an organization. In the rare moments that she is not focusing on clients, Dipti enjoys running, playing with her dogs, and hanging out at the lake with her husband, Gordon.